Daniel Padilla's alleged misspelled tweet caused a debate online! Check this out! Home / News / Daniel Padilla's alleged misspelled tweet caused a debate online! Check this out! We all know for a fact that Daniel Padilla is one of the most admired teen actors in the showbiz industry. He is indeed one of the most popular among the young actors. But just recently, Daniel Padilla has become the center of controversies after he posted a Tweet on his Twitter account saying that he goes for Mar Roxas in the 2016 elections. 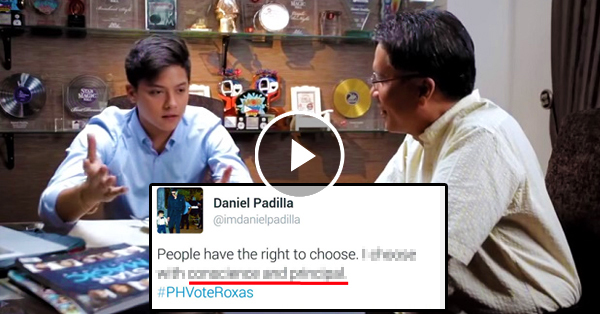 The said tweet of Daniel Padilla is now circulating online and has been shocking the netizens! In his tweet he stated that People have their right to choose who to vote. But what caught the netizens' attention is the word "Principal" in is tweet. They claim that Daniel Padilla may have misspelled the word and got confused between "Principal" and "principle." Meanwhile, some of Daniel's supporters have defended him by saying that the phone might have auto corrected what he's typing.